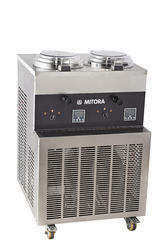 Prominent & Leading Manufacturer from Ahmedabad, we offer live ice cream batch freezer mvx-1, live ice cream batch freezer mvx-2, live ice cream batch freezer mvx-3 and live ice cream batch freezer mvx-4. The machine facilitates production. display and selling of freshly churned Gelato. Sorbet and natural Ice-Creams. All parts in contact with the ingredients and the ice-cream are made of good grade stainless steel and non-toxic material. 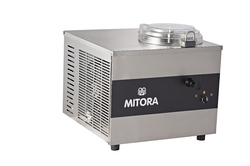 Independent creaming tank allows maximum flexibility of use. Transparent lid permits follow in view of the ice cream during the whole process of Ice-cream making. Automatic stopping of the churner on opening of lid. 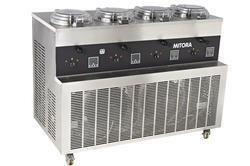 Control panel consists of a reset function, churner control, density and temperature control of the ice-cream and night storage mode for better functionality. Allows addition of ingredients such as dry fruits, fresh fruits etc. at anything during the process. Wash water discharge in the creaming tank makes the cleaning simpler. 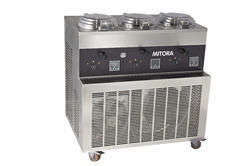 Night storage mode allows the storage of ice-cream overnight without letting the quality of the product degrade.